Waking up in Metropolis General Hospital, Lex Luthor is greeted by his new therapist, Tammy. Tammy begins to question Lex, but he beats around the bush and avoids them like the plague. After getting dressed, Lex walks out of his hospital room and tells Otis to tell Tammy how well LexCorp stock is doing that day. Otis reveals that it went way up and Lex tells Tammy that it's "Sympathy for the Devil". At Watchtower, Tess is watching Lex and Otis in his hospital room, and begins to order Lex some Oxycodone, with sinister motives. However, a situation develops in downtown Metropolis and Tess calls Superman, who is currently handling another situation somewhere else. Tess has no choice but to get involved and save a father and daughter from a burning building. Tess takes control of a rescue chopper and a crane by remote and uses them to save the family from being burned alive. Elsewhere at LexCorp's R&D Department, Lex encounters his scientists who tell him that they have been collecting meteor fragments from the ship that appeared when the Guardian Platform malfunctioned. They reveal that the meteorites they picked up have traces of Earth metals and minerals in them, as if Earth had exploded. However, the atomic charges are the exact opposite of what they should be, which causes Lex's curiosity to rise. They then tell him that the ship had landed in Smallville and has been transferred back and forth between Queen Industries and S.T.A.R. Labs. Lex decides that they need to steal it. Story - 3: I wasn't feeling it as much with this chapter. Last chapter got me all revved up and excited, but this week's was not as interesting to me. The scene with Lex in the hospital was actually kind of boring and felt very filler. I would have much rather seen Tess helping out another team of heroes, say Cyborg and Aquaman (a Season 11 Special that I NEED to see! ), than watch Lex go at it with a therapist. Now, I know that I said in my last review that I like it when the comic reflected the tone of the TV series, and I do, but this seemed like it was an unnecessary break. I mean, couldn't we have picked up with Lex again in his office just after getting out of the hospital? I don't know, maybe I'm nitpicking it too much, but that's just my opinion. Now, I have to say, I loved that CorTessa was able to take control of the helicopter and crane like she did, if you ask me, that was the coolest part! It was very cool and it gave her an actual purpose as opposed to being a stand-in for Chloe as she's busy being pregnant. No matter how much I dog Tess being in this book, I cannot get over how cool I thought that this was. Cheers Mr. Miller, you had my curiosity but now you have my attention! Last but not least, the scene at LexCorp R&D was cool too. I liked how Lex already knew what the scientists and researchers were telling him ahead of time. That is classic Lex Luthor. 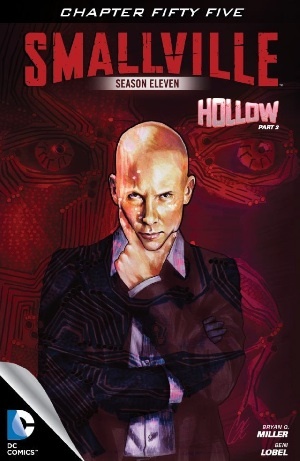 Overall, not the strongest chapter of Smallville: Season 11 by any means, but it did give me hope that I can actually enjoy Tess Mercer in this book and it gave me my Lex Luthor fix of the week for sure! Art - 5: I liked the artwork a little bit more this issue actually. I liked how Tess was drawn a little more and I actually really liked how Clark as Superman was drawn, for the brief two-panels that we see him. Lex, as always, is superb.